Bomber Crew is here! Here are our impressions from what we saw at Gamescom. Imagine what a realistic WW2 bomber game might look like. Go on. I bet the image in your head doesn’t match the adorable, Nintendo-inspired presentation of Bomber Crew. There is a very good reason for that discrepancy: the life of a bomber crewman during the Second World War was generally very short – this isn’t happy-go-lucky territory. 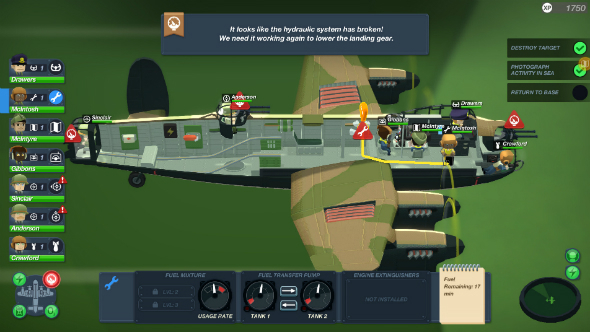 It was roughly two weeks for new crewmen, and four flights for tailgunners of Avro Lancaster bombers, such as the one you command in this FTL-inspired ship survival sim. Related: check out our list of the best PC simulation games. Look past the Miiverse aesthetic however, and you’ll find a deep, tactical, and claustrophobic experience. A few quirks throw it out of the realm of realism – such as sending crew members to walk along the plane’s wing to fix one of the propellers – but the tone is spot on. In the heat of a mission, you can rely on there being more emergencies to attend to than you can possibly handle: enemy fighters to shoot down, targets to spot, bombs to drop, repairs to make, crew members to check up on, heal, and reassign, altitude and course adjustments to make, AA fire to avoid, and a flying behemoth to bring back in one piece. Phew! Between missions you can improve your plane with new weapons, mechanical upgrades and modules, as well as level-up your crew members to make them more efficient on your next outing. 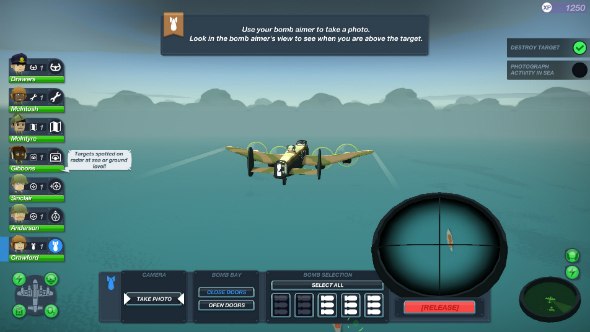 In Bomber Crew, both aircraft and crew members are subject to permadeath, so upgrades like more effective weaponry can be the difference between keeping or losing your veteran gunner during your next bombing run. Losing the plane itself is a bit more catastrophic, as not only will you have to use a minimum-spec Lancaster on your next mission, you’ll also lose a high proportion of your crew – airmen will parachute out before impact, but they’re much less likely to make it back to Britain if you go down over water or behind enemy lines. The level demoed to me at Gamescom 2017 is from the second half of Bomber Crew’s 30-mission campaign. It opens with an objective outline. We are to fly to an enemy military target near Poland, identify and recon the objective from high altitude, blow it to kingdom come, and return home in one piece. Things get off to a smooth start, no hiccups during take-off and crystal-clear skies as we cross the English Channel. 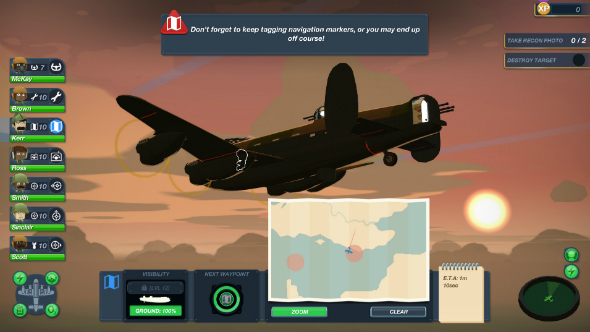 It’s during this peaceful period that developers Runner Duck point out Bomber Crew’s map, which is a massively scaled-down, but geographically accurate copy of Western Europe. There is also a full day/night cycle – it is nearly dark by the time the Lancaster reaches Calais, which should keep it concealed until we reach our target. A minute later and we’re there. The viewpoint shifts as we select our bomb aimer, and we manually scan the ground for the target buildings. Sighted and marked, we descend to a lower altitude, and prepare to drop our payload of high explosives. Then a search light hits us and all hell breaks loose. Enemy fighters appear on the horizon, flak guns open fire from the ground – even the mighty Lancaster couldn’t survive this for too long. We hop back to the bomb aimer and line up the all-important run, drop the bombs, and watch the resultant fireworks display. No time to dawdle though, as those fighters are now strafing us with machine gun fire. A quick list of orders goes out, the first instructing the pilot to climb out of range of AA fire, the second telling the flight engineer to put out an electrical fire, and the last commanding the bomb aimer to move up to the Lancaster’s front guns. Damage is location-based, so as we watch an enemy ace swoop down on us from above, we also see the roof of our bomber torn to pieces, leaving certain crew members and vital equipment exposed. We call in some friendly fighters with our radio operator, a high-level ability that buys us some precious time while we reload weapons and repair damage. It’s not long until there’s just the ace enemy pilot left to deal with, but we’re a crew member down – Sinclair, our mid gunner has been fatally wounded. We move back to the pilot and order a corkscrew manoeuvre that helps us escape any further damage, then reassign another crew member to take Sinclair’s place, and eventually take down the miniboss. Calm returns as we hit the English Channel again, but the Lancaster is visibly battered. We’ve lost one of our best crew members and have an engine on the brink of failure; everyone else is on the verge of freezing to death as a result of having spent the past few minutes at high altitude with a hull that could be repurposed as an industrial-size colander. The remainder of the journey is spent juggling crew members in an effort to nurse the lumbering giant home. It is a surprisingly tense experience, which is all the more impressive considering both the shooting and piloting are automated. Your job in Bomber Crew is strictly managerial, you tell everyone what to do and where to go, but it is up to them and their individual skills to get that job done, which is precisely why losing a high-level crew member like Sinclair is to be avoided at all costs. If we had lost our radio operator for example, we would have been without Spitfire support, which would almost certainly have led to us losing the whole plane. Bomber Crew takes all the micromanagement and long-term strategy of FTL, but opts for a much more intimate point of view. For the bulk of the mission you’re staring at a cross-section of your plane, speech bubbles pop up constantly, informing you of new situations and threats, and every time you need to spot a target, drop bombs, or snap a recon photo, you adopt the point of view of the crew member carrying out that job. It’s a more immediately grabbing place to be, and it allows for all the spectacle and fish-in-a-barrel claustrophobia that the setting demands. Sure, it looks like war has arrived in the Miiverse, but it feels like the real deal. 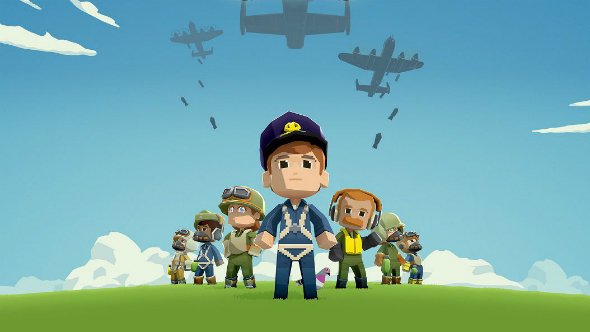 Bomber Crew is out now. Sound off in the comments below to let us know what you think of it.